The China-sponsored Asian Infrastructure Investment Bank was formally launched over the weekend. Many observers have seen it as a rival to the World Bank. Others saw in another vehicle that would be used to facilitate the internationalization of the Chinese yuan. Surely the world can use more development banks. The AIIB will co-finance some projects, and it will also fund some stand-alone projects. Its initial capital equity is $100 bln. The PRC will retain a 26% voting share, and important decisions require a super-majority of 75%. This means that the PRC has a veto. The US has sufficiently large quota at the IMF to give it a veto on significant decisions. 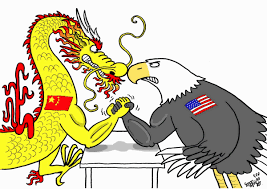 The US reservations about the AIIB do not appear to stem from a fear that the yuan is going to replace the dollar. Indeed, even Chinese officials have not pushed this line as much as some journalists and bloggers. Indeed, given China's clumsy handling of the yuan and equity market seems to have torn the veneer away to reveal that Chinese markets may not be ready for prime time. Xiao Gang the head China's version of the SEC (China Securities Regulatory Commission) gave a speech yesterday in which he gave no sign that the rumors suggesting he was resigning were true. Instead, he offered his assessment of the decline in Chinese equities. He argued that the Chinese system, stock market, regulatory environment, trading systems are not immature, incomplete, and flawed. The US reservations about AIIB stem from concerns that the standards used by multilateral lenders such as the IMF and World Bank may be diluted. In addition to financial lending criteria, multilateral lenders also take into account human rights, labor right, and environmental issues. Chinese officials want to argue that these are ideological constructs further US aims. That said, part of the push back against the TPP agreement, which does not include China, among parts of the American electorate is that it does not sufficiently protect labor rights and the environment. Trump, Clinton, and Sanders do not support TPP. Still, fear is that the World Bank may turn down a project on human rights and labor rights grounds and that AIIB provides the financing instead. China has often taken more of hands off the view of issues that it wants other to respect as domestic affairs. It may also be less ideological disposed toward proselytizing than the US. What is a purely domestic affair does not seem as straightforward as it may appear. It looks like this is a historical category, meaning that it changes over time. In fact, last week, the EC launched an unprecedented investigation into whether Poland has a "democratic deficit." The bottom line is that if one believes that there is a hegemonic stability crisis, the AIIB does not seem to be the kind of evidence that some previously seemed to envision. Its quotas will likely be paid in dollars and loans will be exclusively in dollars. The challenge lies in the criteria it uses to fund projects.